Admit it: ordinary matter is kind of boring. Sure, it constitutes every object in the known universe (dark matter notwithstanding), but what has it done for us lately? It’s time to take matter into our own hands, to shape it to our will, to control it as easily as we control our computers and smartphones. It’s time for programmable matter. Programmable matter is essentially what it sounds like: matter that can change its physical properties, such as its shape or optical characteristics, based on a user’s input. 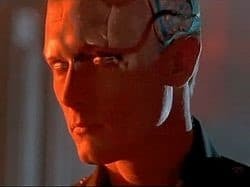 This definition ranges from something as simple as liquid crystals, which can be altered by the application of an electric field, to something as sci-fi as the shape-shifting liquid metal T-1000 from The Terminator franchise. Let’s take a look at some of the current research into programmable matter, and where it could eventually end up. We’ll begin by discussing two different engineering approaches to realizing programmable matter—modular robotics and metamaterials—and then consider how they might ultimately converge. The modular robotics approach to programmable matter aims to develop robotic units capable of arranging themselves into arbitrary configurations. 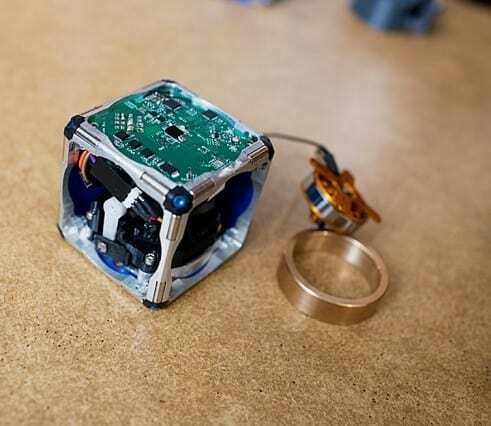 For example, in 2013, a team of MIT engineers developed the first prototypes of what they called M-Blocks, tiny cube-shaped robots capable of propelling themselves without any external moving parts. Grouped together, the M-Blocks could organize themselves into simple cube-based configurations. To locomote, M-Blocks pivot around their edges using the principles of angular momentum. Inside each robot is a flywheel that spins at up to 20,000 rpm. When a sudden braking is applied to the flywheel, it transfers its momentum to the M-Block, propelling it forward. To arrange themselves in groups, each M-Block is equipped with two cylindrical magnets embedded along each edge, which keep the M-Blocks in place as they pivot over other M-Blocks. An additional eight magnets on each face help keep the M-Blocks in a square alignment. Not all modular robots are cube-shaped. Another team from MIT took inspiration from the geometrical complexity of proteins to develop moteins (motorized proteins), chain-like assemblies composed of simple robotic modules. Moteins are based on a paper from 2011 that outlines a technique whereby any 2D or 3D shape can be achieved by folding strings made up of simple robotic subunits. 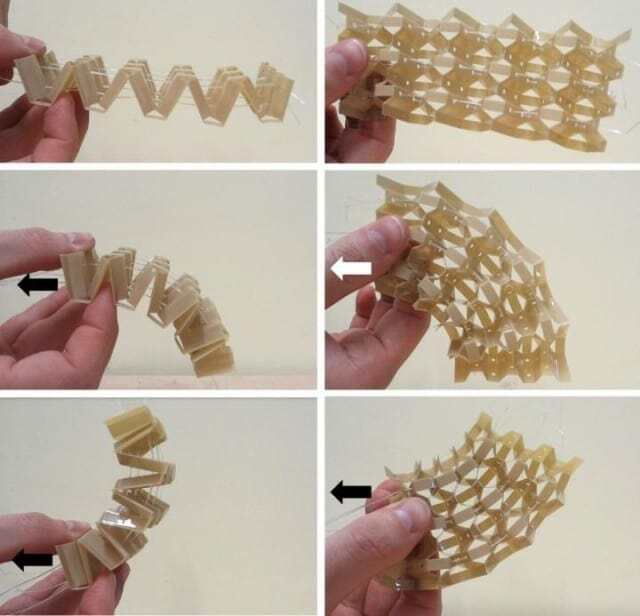 “It’s effectively a one-dimensional robot that can be made in a continuous strip, without conventionally moving parts, and then folded into arbitrary shapes,” said MIT researcher Neil Gershenfeld. Another engineering approach to programmable matter is to develop materials with properties that can’t be found in nature, called metamaterials. This offers engineers and materials scientists the opportunity to devise substances that can be controlled in unique ways, or even substances capable of inherent computation (sometimes called computronium). 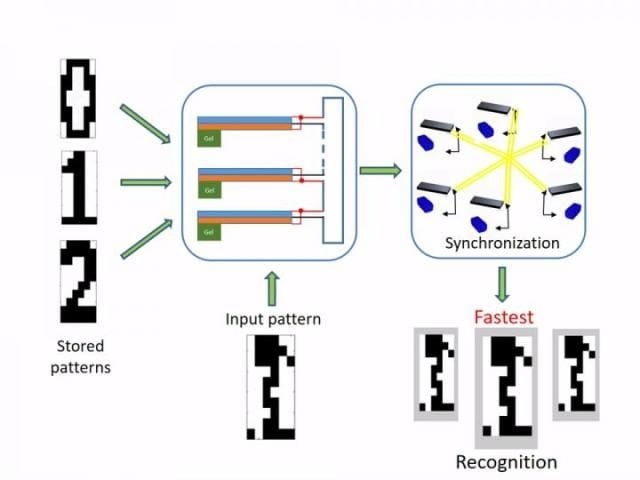 In 2016, researchers at the University of Pittsburgh made exciting progress in programmable metamaterials by developing a hybrid material system capable of simple pattern recognition. In this system, units of a piezoelectric (PZ) cantilever are integrated with a self-oscillating gel undergoing what’s called a Belousov-Zhabotinsky (BZ) reaction. Together, a network of BZ-PZ units can autonomously perform computational tasks without the need for an external electrical power source. To demonstrate pattern recognition, the researchers stored a black-and-white image into a BZ-PZ network by altering the polarity of each individual PZ cantilever. In this way, each BZ-PZ unit in the network represented a binary pixel in the original image. Next, the network was given an input, specified by the initial phase of oscillation in each BZ-PZ unit. Over time, the BZ-PZ phase differences converge to the stored pattern—the quicker this convergence, the more similar the stored and input patterns. Other metamaterials that could pave the way to programmable matter have been designed with shape-shifting capabilities. For example, engineers from the University of Bristol developed a metamaterial inspired by the Japanese paper art of kirigami (similar to origami, but with cuts in addition to folds). By applying tension to a kirigami honeycomb structure, they were able to manipulate the material’s shape and mechanical properties. Another shape-shifting metamaterial, courtesy of engineers and material scientists at Washington State University, is able to morph when exposed to heat and light. Based on molecules called liquid crystalline networks (LCNs), a sort of Jello-like cross between liquids and solids, the metamaterial can fold, unfold and even heal itself when damaged. Yet another metamaterial, developed from silk protein, can be designed for different biological, chemical, or optical functions. One application of this material is a surgical pin that changes color at the peak of its mechanical limits. “This approach is a step toward the development of multifunctional devices that may liaise between the biotic and abiotic worlds,” according to the Tufts University engineers behind the silk-based metamaterial. It’s possible that robotics and metamaterial will both be required to develop the ultimate form of programmable matter. If so, bridging the gap between modular robotics and shapeshifting metamaterials would be the key to creating a smart, morphable, and of course, programmable substance. One name for this ultimate form of programmable matter is claytronics, a field which envisions Terminator-style matter that can take on any shape it pleases. The main unit of claytronics is the claytronic atom, or catom, envisioned as a nanoscale computer that can communicate and interact with other catoms. Ideally, users should be able to interact with groups of catoms to change their shape at will. 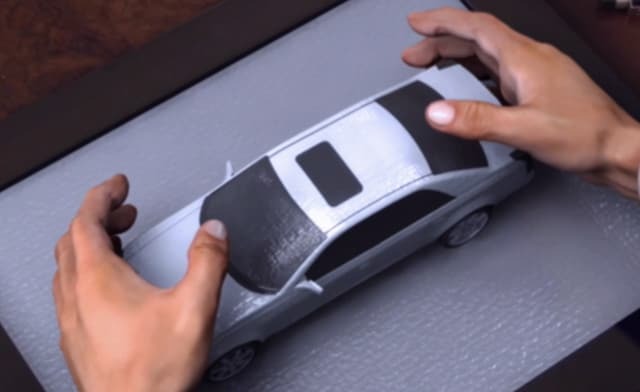 For example, this concept video from Carnegie Mellon’s Claytronics Project shows car designers interacting with a small, claytronic model of a car: shaping it, passing it around and even changing its color. Perhaps one of the most disruptive applications of claytronics would be a revolution in the way we communicate. Forget audio and video—claytronics can provide an entirely new sense for communication called pario, which combines aural, visual and physical sensation. Imagine a futuristic version of Skype where you don’t just see and hear who you’re talking to, but where you can physically interact with a true-to-life claytronic model of them as well. “Our goal is to give tangible, interactive forms to information so that a user's senses will experience digital environments as though they are indistinguishable from reality,” reads the landing page for the Claytronics Project. You mean beyond the potential melding of digital and physical reality? Don’t worry: that’s just the tip of the iceberg. If you’re keeping track of the years, 2016 was the end of that relatively short time frame. Regardless, the report was convincing enough that DARPA funneled $4 million USD into a programmable matter program in 2009. “The Programmable Matter program will develop a new functional form of matter, constructed from mesoscale particles that assemble into complex 3-dimensional objects upon external command. 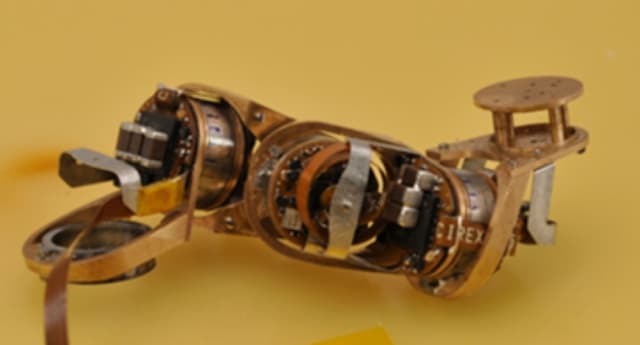 These objects will exhibit all of the functionality of their conventional counterparts and ultimately have the ability to reverse back to the original components,” reads the budget report. MIT’s motein research was one of the fruits of this project. There’s good reason for DARPA to be interested in programmable matter, as it offers a number of military applications. For example, like the claytronics model car, military personnel could make plans with a 3D map of a battlefield that could be shaped as needed. Programmable matter could also be used for a “universal spare part” to fix problems in the midst of battle. Even more ambitiously, soldiers could have seemingly magical access to tools on demand. While Zakin’s “paint can” sounds like the epitome of the Arthur C. Clarke’s claim about technology and magic, the potential applications of programmable matter don’t end with the military. 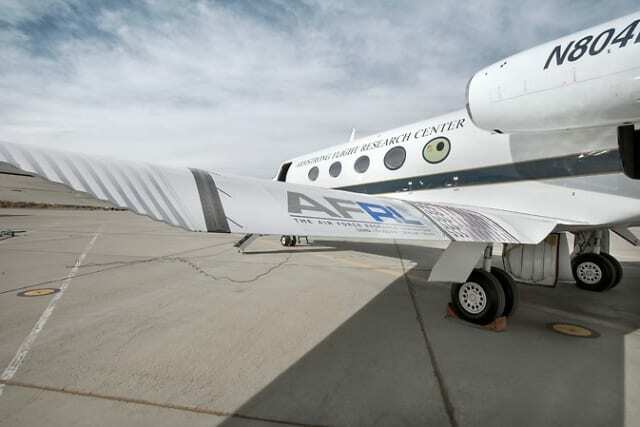 In the realm of aerospace, programmable matter could produce an aircraft that could change the shape of its wings mid-flight. Ascending a bit higher, programmable matter offers new possibilities for manoeuvering and assembling complex objects in space. Electronics could also benefit immensely from advances in programmable matter. Smart, adaptive antennas could change their structure in response to users’ changing requirements. Additionally, adaptive electronics would be great for variable environments, allowing usability from the dust and heat of the desert to the moisture of the jungle. “When you buy a tool or a radio, you’re not limited to the installed version of what you bought… it will be able to adapt to the environment and what you need it to do,” said Zakin. Programmable matter could also impact our regular, everyday lives. For example, smart clothing would be able to alter its characteristics in response to temperature changes or user preference. Or perhaps you forgot your housekey—no problem, just reach into your magic paint can and pull out a new one. Or, with the physical sensation of pario, you could cuddle up with your significant other to watch a movie while they’re away on a business trip. At the end of the day, the promise of programmable matter seems to be limited only by our imagination. At the most futuristic end of the spectrum is a complete end to scarcity: with general purpose matter on demand, we’ll be able to stretch our resources to the absolute limit. One popularized doomsday prediction for technology like programmable matter is called the grey goo scenario, a hypothetical outcome where nanoscale robots consume all of Earth’s biomass in order to either self-replicate or construct some preprogrammed product. While some far-out sci-fi scenarios pose an actual risk (like a runaway artificial intelligence), it seems that the grey goo scenario really is just science fiction. “So-called grey goo could only be the product of a deliberate and difficult engineering process, not an accident,” said Chris Phoenix, co-author of a paper about the safety of exponential manufacturing and director of research at the Center for Responsible Nanotechnology. If a soldier in battle can reach into a paint can and pull out a hammer, why couldn’t they pull out something much more devastating? Why couldn’t a civilian, with access to similar technology, craft powerful weapons unbeknownst to any authority? As Phoenix’s co-author Eric Drexler points out, there are many concerns like these that will have to be addressed as programmable matter technology advances. So when exactly will we obtain the powerful capabilities of programmable matter? As we’ve seen, research into the subject is both active, varied and fruitful. Despite some overly optimistic expectations (unless DARPA is holding out on us), it seems inevitable that our engineering capabilities will eventually catch up with our futuristic fantasies. Of course, whether that offers an end to scarcity or leaves us all as grey goo remains to be seen. What are your programmable matter predictions? Leave your thoughts in the comments below.